Las Vegas, Nv., March 10, 2014 – It was all about redemption for Bob Schiotis and the Fresno Grizzlies. Last year the Grizzlies watched as the USA Patriots did a victory dance following their 10-3 championship game win in the 65-and-over division. It is never easy to win a championship, but Schiotis, the long-time leader of the Grizzlies, felt he had all the pieces in place this year to win the title. Even though the team moved to a younger age bracket, it gained a great pitcher in John Baker who was a “no-pitch exception” on the 65-and-over squad in 2013. 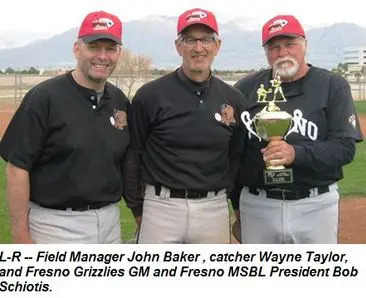 Baker threw a complete game scattering 11 Hits, six strikeouts and a walk as the Grizzlies defeated the San Antonio Broncos 7-2 to claim the 60-and-over finals at the 2014 Kickoff Classic. Baker pitched three innings of the first game, and four innings of the second game for the Grizzlies, and played infield or outfield most of the rest of the time. By the fourth game rolled around, “he told me that he wanted to take a break and volunteered to catch,” Schiotis said incredulously. Baker caught six innings the day before the finals. Another piece of the puzzle was Mike Griffin, an import from the Houston MSBL whom Schiotis said fit the team chemistry perfectly. Griffin’s two-run homer over the fence in left-center field in the bottom of the eighth inning all but iced the win. The Grizzlies went undefeated (4-0)in pool play and garnered the top seed for the championship game. Jim Gutierrez’ Broncos, meanwhile, were 3-1 in pool play, and walked into the finals with a chip on their collective shoulder because with their only loss came to the Grizzlies. Through the first six frames it was anybody’s game. Baker allowed just one lone run in the fourth inning, while Broncos’ starter Luis Sanchez spotted the Grizzlies three runs in the bottom of the third inning. The Grizzlies emerged from an offensive hibernation in the seventh with a two run outburst to take a 5-1 lead. They capped the scoring the next inning thanks to Griffen’s bomb – and this time is was the Grizzlies dancing in jubilation. Schiotis didn’t hesitate in naming John Baker and his battery mate catcher Wayne Taylor as co-MVP’s. “Their contributions throughout the tournament were too numerous to mention, but both of them really held this team together and are the main reasons that we are champions”Schiotis said. Schiotis was downright giddy about the team’s great chemistry. “If we would have lost we would have had just as much fun,” he said. Luis Sanchez, Javier Hihojosa (8) and Jesus Rodriguez.